Day-Timer – If you are constantly on your phone like I am (not social media, but phone calls! ), you will appreciate the view of your calendar in front of you when booking appointments and scheduling your projects. I have my day-timer with me everywhere I go. I use it as a notebook as well as a way of keeping track of my clients and meetings while on the go. I keep a separate section of things I need to do next to my weekly schedule and prioritize time off to do things for ME. Google Docs – USB keys, external hard drives, sometimes it’s hard to keep everything in one place and you sometimes forget to add it to your bag in the morning on the way out of the door. Google Docs is a great way to keep all of your files together for each access. You can access them from anywhere and update and use your documents as required. This is essentially great for bloggers constantly working out of coffee shops! Alternative: Dropbox. Photoshop & Adobe Illustrator – If you are a content creator or design your own marketing, these two programs can save you a ton of money! I self-taught myself how to use these two programs and with a little time and patience, you can as well. I use Photoshop to design the quotes I post on my Instagram and also to edit my photos for open houses, etc. Illustrator is used to create my marketing materials for promotional use. I just design them myself and print them at a print shop. Boomerang - What it's good for: Scheduling emails like a boss. If you're like me, sometimes you work better at night. But your clients don't have to know that! Respond to emails when you can, and schedule your messages to go out during your office hours. Freshbooks – What it's good for: getting paid like a boss. Send branded invoices and schedule payment reminders to keep your bank account happy and healthy. Alternatives: Quickbooks & PayPal. Boomerang - What it's good for: Scheduling emails like a boss. If you're like me, sometimes you work better at night. But your clients don't have to know that! Respond to emails when you can, and schedule your messages to go out during your office hours. Alternative: Sidekick. These are just a few of my favourites tools I can’t live without. 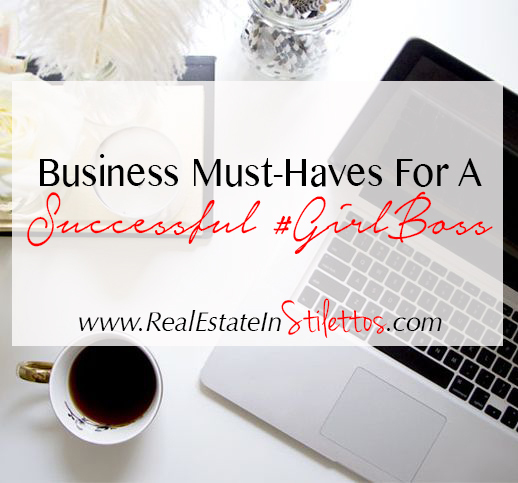 There are many different tools to help you get on top of your #GirlBoss game. Find what works best for you and use a few different tools to get a feel for each. One may work better for you than it would someone else depending on the nature of your business.